Job seekers can submit an Advance Auto Parts application for a chance to work for one of the biggest companies in the automotive industry. Founded in 1932, the company currently owns over 5,372 locations spanned over the United States, the U.S. Virgin Islands, Canada, and Puerto Rico. Their impressive development has earned them a spot on the prestigious Fortune 500 List. The company’s customer service department can be reached at 1-877-ADVANCE (238-2623) every day of the week. Customers can go to the Advance Auto Parts Contact Us page to find the complete list of contact options. The company’s mailing address is as follows: Advance Auto Parts, Inc., Store Support Center, 5008 Airport Road, Roanoke, VA 24012, United States. All candidates for Advance Auto Parts careers must be at least 18 years old to be considered eligible for the application process. Please note that all younger applicants will be automatically excluded as this is one of the main employment eligibility requirements that they are required to meet. 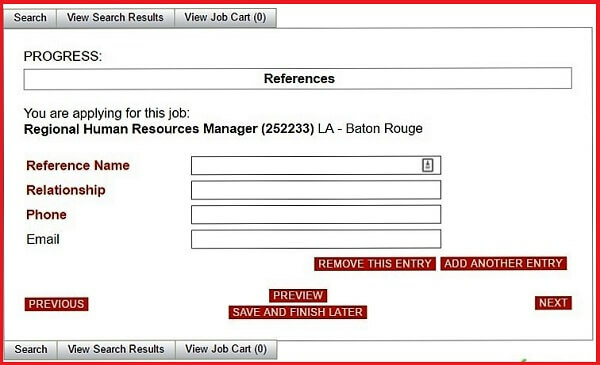 Job seekers can access the complete list of Advance Auto Parts job openings on the company’s online employment portal. They can select their preferred location to find the best jobs in their area. Here are the main departments they can apply for on the portal. Job seekers can visit the Advance Auto Parts employment portal to explore the updated list of job openings. They can select the career area and location that best suited them to find the best possible employment opportunities. 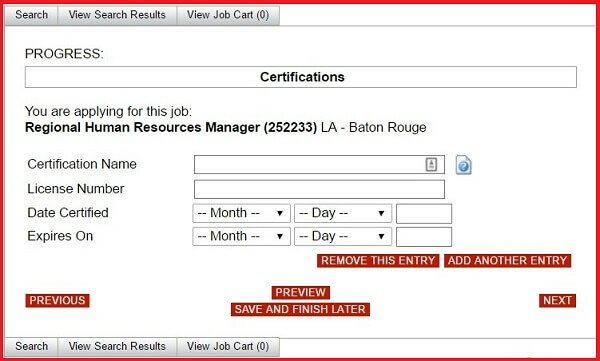 They can read the full description of their chosen Advance Auto Parts careers by clicking on the job titles. If they meet the employment requirements and wish to be considered for the available positions, they are required to submit an application form online through the portal. To do this, they will have to create a profile on the Advance Auto Parts careers portal. Then they can proceed to fill out the standard online jobs and employment form. This is the first section of the Advance Auto Parts job application form. Candidates are required to provide their full legal name and their main contact information. Please note that the company’s hiring specialists will then use this data to contact them regarding the upcoming steps of the employment assessment process. This section of the Advance Auto Parts job application form requires candidates to provide information about their salary expectations. Please note that the fields regarding their salary are mandatory. Candidates must fill these out to be granted access to the following sections of the form. Candidates must provide information about their salary expectations for this section of the Advance Auto Parts application form. Lastly, they will be asked to specify how they have heard about the Advance Auto Parts job they are applying for. This information will help the company representatives optimize the visibility of their job listings. The Resume Upload section of the Advance Auto Parts job application form requires candidates to provide their CVs and cover letters. They can upload these documents from their computers directly onto the portal in one of the supported file types. 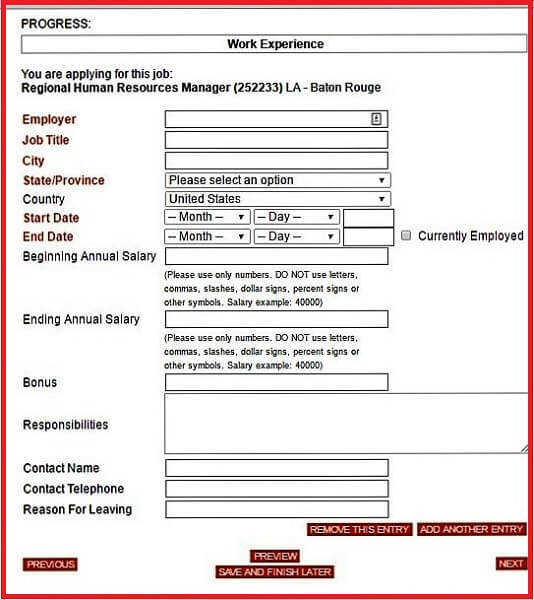 Candidates must provide their resumes and cover letters for this section of the Advance Auto Parts application form. This section of the Advance Auto Parts job application form requires candidates to include information about their previous employment. They will have to list their previous jobs in reverse chronological order to provide an overview of their professional careers. Candidates must provide information about their previous employment for this section of the Advance Auto Parts application form. For each entry they make, they will be asked to specify the name of their previous employers, the name of the positions they have had, as well as the specific period of their collaboration with the company. Please note that all candidates must make at least one entry to this section. For this section of the Advance Auto Parts job application form, candidates must provide information about their academic background. As for the previous section, they will have to create an outline of their education by making separate entries for each program they have been enrolled in. 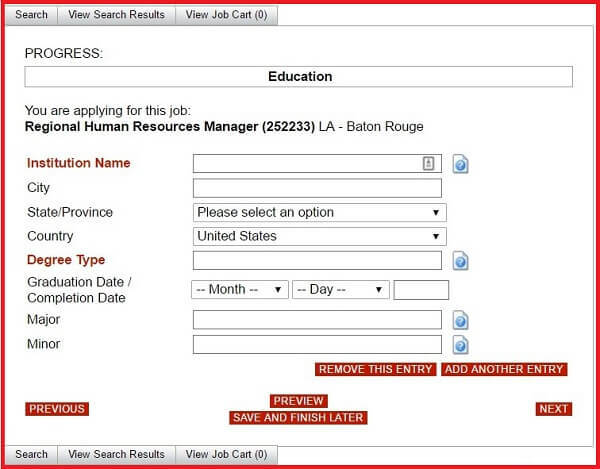 Candidates must provide information about their education for this section of the Advance Auto Parts application form. Please note that all candidates are required to create at least one entry for this section to be granted access to the following sections of the form. This section will help the company representatives get a better idea of their formal education. Candidates may include information about the licenses and certifications they have earned throughout their careers for this section of the Advance Auto Parts job application form. As for the previous sections, they will have to make separate entries for each document they would like to include. Candidates must provide information about their licenses and certifications for this section of the Advance Auto Parts application form. 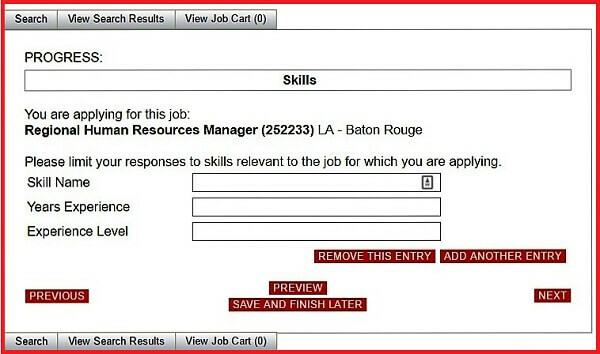 Job seekers can list their skills and qualifications for this section of the Advance Auto Parts job application form. Please note that they will have to make a separate entry for each skill they want to mention in their form. We strongly advise them to provide as much information as possible to provide the hiring specialists with complete information about their experience. Candidates must provide information about their professional skills for this section of the Advance Auto Parts application form. For this section of the Advance Auto Parts online application form, candidates must provide professional and personal references. Please note that they are required to include at least one entry to be granted access to the following section of the form. Candidates must include references for this section of the Advance Auto Parts application form. However, candidates should know that they can include several references to create a complete application. They will have to create separate entries for each reference they want to include. 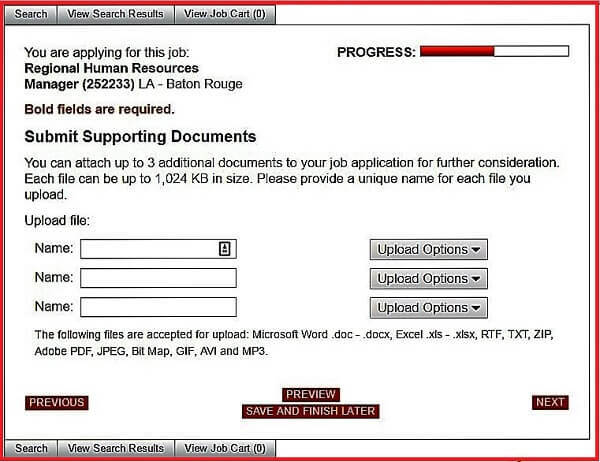 Candidates can upload any additional documents they deem appropriate for the hiring process to this section of the Advance Auto Parts online application form. They can include copies of their diplomas, transcripts, as well as any other supporting documents that may present their careers in a relevant way. Candidates may include additional documents for this section of the Advance Auto Parts application form. For this section of the Advance Auto Parts online application form, candidates are required to answer a few questions as part of the federally mandated Equal Employment Opportunity questionnaire. They will be asked to mention their race, gender, ethnicity, disability status, and veteran status. 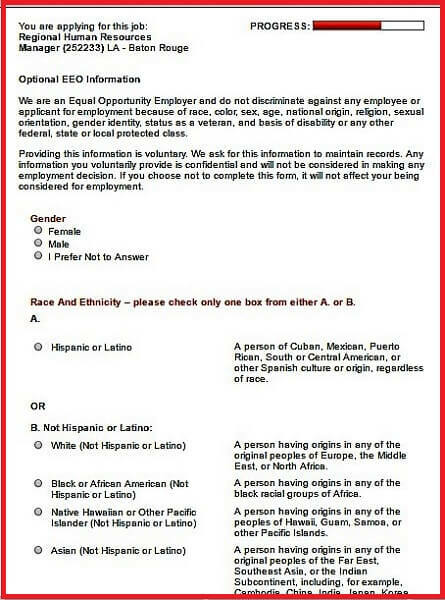 Candidates must answer the EEO questionnaire for this section of the Advance Auto Parts application form. Candidates should know that they are required to select one of the provided answers for this questionnaire to complete this section. However, they are not obligated to disclose any information that they are not comfortable sharing with the hiring specialists. The outcome of their Advance Auto Parts job applications will not be affected by the information they provide to this section. 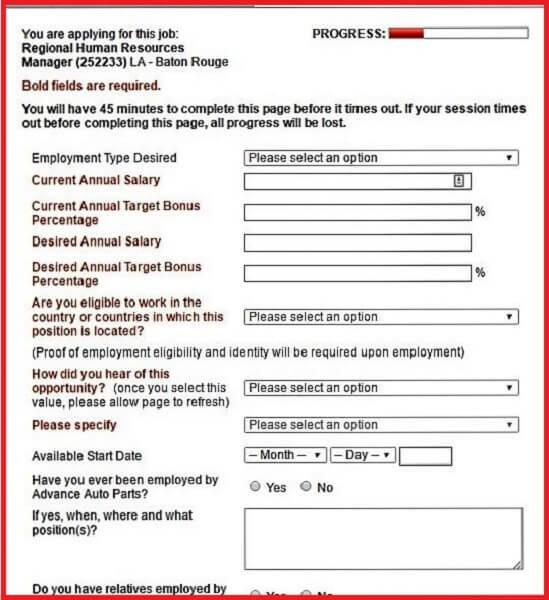 This section of the Advance Auto Parts job application requires candidates to read the company’s disclosure regarding the background checks they may opt to conduct on the applicants as part of the hiring process. 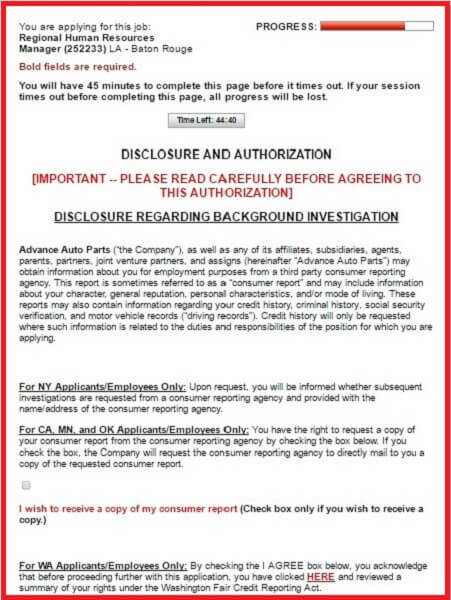 Candidates must go through the portal’s Disclosure statement for this section of the Advance Auto Parts application form. Please note that candidates will be asked to certify that they agree to the terms featured in the disclosure to be granted access to the following section of the Advance Auto Parts job application. If they do not agree to the terms featured here, they must exit the employment portal. They can then contact the company representatives regarding their comments and complaints about the background checks. This is the final section of the Advance Auto Parts application form, where candidates will get to see their completed forms and make any modifications they deem necessary to provide the hiring specialists with the correct information about their professional and academic background. Upon completing their reviews, candidates may submit their Advance Auto Parts applications to the company’s Human Resources department for the formal assessment process. They will be able to keep track of their application status on the employment portal. When their forms are labeled “assessed”, they should expect to be contacted by the HR specialists. The updated list of employment opportunities at Advance Auto Parts is available on the company’s job application portal. They can select their desired location, as well as the career level that is best-suited for their experience to find the ideal careers for them. Young professionals seeking a career in the automotive industry are well advised to apply for Advance Auto Parts internships because they will get a first-hand experience of what it is like to work for one of the most successful companies in the entire sector. They will get to work alongside highly trained professionals and develop valuable professional skills. The average Advance Auto Parts salary for interns is $14.00/ hour. The exact rates will be negotiated during the interview process according to the specific skills and expertise of the applicants. Job seekers can find the complete list of career opportunities on the Advance Auto Parts job application portal. They can conduct a personalized search to find the best-suited positions for their professional expertise. To be considered for their chosen positions, they must submit their applications online through the portal. 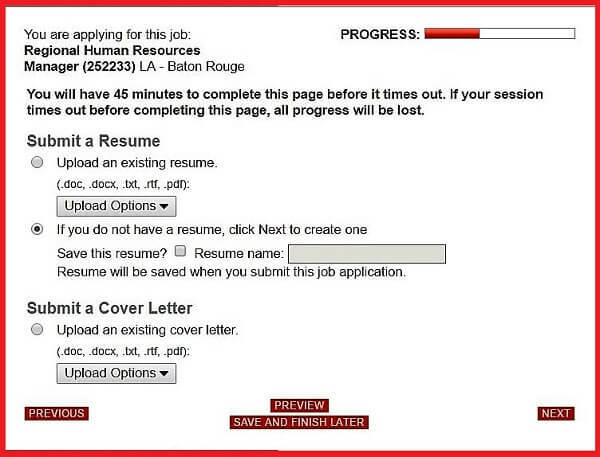 Candidates should expect to spend approximately 30 minutes to complete the Advance Auto Parts application form, provided that they have access to the updated versions of their resumes. Uploading a cover letter to their forms is optional. 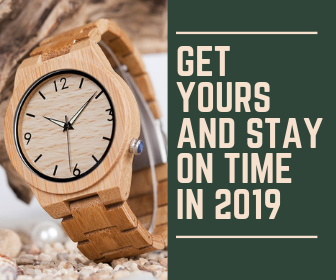 However, we strongly advise them to take their time with to write one because it will enable them to add a more personal approach on their applications. Their cover letters should be no longer than one page and they should be focused on their specific experience and skills that enable them to perform the main requirements of their chosen Advance Auto Parts careers. They should also mention why they are interested in applying at the company. Please note that the Work Experience, Education, Certifications, and Skills sections are extremely important. In spite of the fact that candidates are only required to make one entry for the Work Experience and Education sections, it is in their best interest to include a complete overview of their professional and academic backgrounds. The Advance Auto Parts hiring specialists will assess their online forms before they get a chance to review their resumes. As such, it is very important that they have access to the full amount of information about their professional experience. Candidates should know that they can apply for more than one Advance Auto Parts job on the company’s employment form. As such, they shouldn’t limit their career search for only one position. In fact, submitting job applications for several careers may even increase their chances of getting hired by the company. Furthermore, applying for a second position on the portal will take them considerably less than the first one did because the vast majority of the information they include in their applications will remain saved onto their profiles. As such, it should take them less than 10 minutes to complete the application for the second position. All the Advance Auto Parts job applications will be assessed by the company’s hiring specialists. They will select the best-suited candidates for each of the open positions based on their skills and professional experience. The following step of the Advance Auto Parts hiring process is the interview session. The number of job meetings that candidates will be asked to sit through depends on the career level and the department they are aiming for. Candidates applying for high-level positions may be asked to sit through up to four interviews before they get their final answer. The candidates asked to participate in Advance Auto Parts interviews are expected to know quite a bit about the company. They should be familiar with the development process undergone by the company, as well as they major achievements. This type of information will enable them to include solid facts in their interview answers and make a good impression on the hiring specialists. We also advise candidates to review their resumes in contrast with the job description of their chosen Advance Auto Parts career. It is well worth their time to figure out exactly what in their experience recommends them for each of the job requirements. This way, they will provide complete answers to the professional questions in the interview. Lastly, candidates should prepare their interview outfits. Their aim should be to look poised and professional and to remain in line with the proper etiquette of the occasion. They should choose their outfits according to the career level they are aiming for. As such, applicants interviewing for entry-level positions are advised to wear business casual clothing, while those applying for high-level careers should choose formal attire. Candidates should also practice their interview questions before their formal job meeting. While they will be asked different questions during their actual interview, the practice will actively improve their performance. We have selected a few sample questions meant to provide job seekers with an idea of the tone of the interview. Why did you apply at Advance Auto Parts? What makes you qualified to meet the requirements of your chosen Advance Auto Parts career? What do you know about Advance Auto Parts? Do you have any experience with cars? How would you approach a difficult customer? What can you tell me about yourself that is not included in your Advance Auto Parts application?